A mother accused of murdering her 14-month-old daughter told relatives she wanted an abortion when she found out she was expecting a girl, a court has heard. 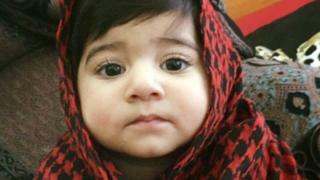 Sadia Ahmed is said to have "cried a lot" and said she wanted a son. Ms Ahmed is accused of smothering Inaya Ahmed by placing a cushion over her face and shaking her. The 28-year-old denies murdering her daughter at the family's Glasgow home in April 2016. Giving evidence at the High Court in Glasgow, Inaya's aunt Shagufta Yasmin said Ms Ahmed "was not happy" and cried when she discovered she was having a girl. "She used to say she wanted a son, not a daughter," the witness told the court. "She said she wanted an abortion. We said 'have faith in God' and he might give her a son next time. "We said if you wish to have an abortion that's your decision. But we're happy with whatever it is." Ms Yasmin said the day that Inaya died she spoke to Ms Ahmed in her bedroom after they had returned from the hospital. She said: "I asked Sadia: 'Tell me how you killed Inaya.' Initially she said: 'It is between me and Allah.'" The witness then added: "She didn't tell me how she did it." Ms Yasmin told prosecutor Paul Kearney that Ms Ahmed said she had put her legs over Inaya to stop her thrashing about and kicking her legs. Mr Kearney asked: "Do you remember your emotions when she was telling you this?" She replied: "I said: 'Do you not feel any mercy for her?' and Sadia smiled." Ms Yasmin said she did not tell anyone about the conversation and added: "I became fearful of her. I couldn't believe a mother could do something like this." The jury was told that on 4 May 2016, Ms Yasmin confessed to police she had killed Inaya by placing a pillow over her face. Mr Kearney asked: "Why did you do this?" Ms Yasmin replied: "I thought they would release Inaya's body. I just wanted justice for Inaya and her body back." The witness was then asked: "Why did you not tell the police it was Sadia that killed Inaya?" Ms Yasmin told the court: "Because at that time I didn't understand what to say or what not to say because I was scared." The jury heard that after Inaya's life support system was switched off on 20 April, Ms Ahmed continued to live with the family in Bernisdale Drive. Defence QC Ian Duguid asked Mrs Yasmin: "If she was a cold, calculating, laughing killer why did you allow her to continue to live in the family home after Inaya died and when there was a seven-and-a-half-month-old child, there?" Ms Yasmin replied: "We made a mistake. We shouldn't have done that." Mr Duguid then asked Ms Yasmin if she ever thought Inaya could be harmed. "No, nobody could," Ms Yasmin answered. "Mr Duguid: "Are you saying that out of the blue one day Inaya's mother takes her upstairs and kills her?" The prosecution alleges that Inaya was assaulted by her mother on 17 April 2016 and died in the Royal Hospital for Children in Glasgow three days later.